The handmade production and the limited number of 99 pieces make Dogma a unique object. An infinite series of personalisation allow a few chosen people to have their own Dogma. 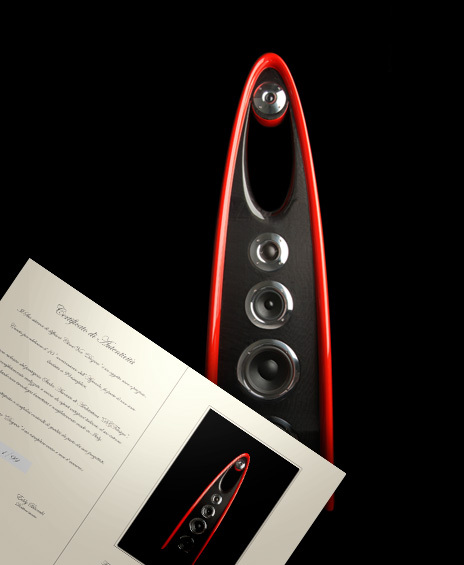 Dogma is an exclusive object that can be personalised on request in colour and finishing: from the painting in any colour to the use of precious metals, from the frontal panel made of carbon fibre to the personalised brochure of the exemplar. Every loudspeaker couplet is numbered and accompanied by the certificate of guarantee and authenticity. The uniqueness of every exemplar, thanks to the company’s data files, makes impossible the realisation of not authorised specimens.